Materials included in the Dudley Family Genealogical Collection were compiled by Naoma Dudley Slone in two three-ring binders with photographs compiled in a separate album. The primary focus of Mrs. Slone’s research relates to the Dudley and allied families, including Shufflebarger and Sturdivant. Some document types included are copies of original records with some original records, copies from family Bibles, obituaries, news clippings, family group sheets, notes, and correspondence. One file of post-Civil War letters addressed to various members of the Wilkinson Family was included with the binders; however no connection could be established to the binder contents. One album containing original and print photographs was also included. The album pages were photocopied to document the manner in which Ms. Slone had compiled them. Original photographs were removed from the album for preservation purposes. All documents are arranged as they were maintained by Ms. Slone. 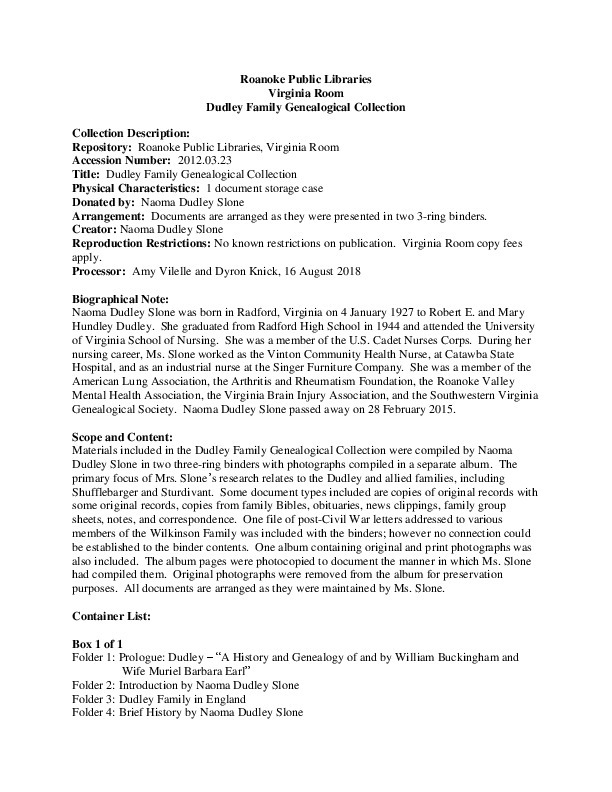 Roanoke Public Libraries, “A Guide to the Dudley Family Genealogical Collection,” Virginia Room Digital Collection, accessed April 19, 2019, http://www.virginiaroom.org/digital/document/DudleyCollection.